As the owner of two different commercial properties that I have used for my law office – a restored 2,600 sf historic 1860 Victorian and a 16,000 sf modern brick building – I can also express on a very personal level my great appreciation for the outstanding quality of your workmanship, the courteous demeanor of all of your staff and subcontractors, and your impressive ability to coordinate obtaining permits, scheduling your trade contractors, arranging for state and local inspections, and meeting the often overly ambitious requests and deadlines from me and from my tenants. The two office buildings that I have owned are quite different, and I found it remarkable that you were able to adapt your style to show proper respect to the historic Victorian while using common sense and value engineered cost-saving strategies for the modern brick building. I cannot emphasize enough the tremendous peace of mind that I felt leaving you in the driver’s seat for all phases of our construction activities – from pre-purchase inspections through custom tenant build-outs. What better vote of confidence could I give to Picus Woodwrights and to you personally than to say that my general contractor always has a set of keys to my building? As a “type A” business owner, I actively provided Picus with feedback on how I wanted my building to look when it was done. One of your many strengths was and is translating my abstract concepts into a well thought out, well organized, and appropriately budgeted construction plan. The professional and polished look of my offices has not been lost on either our clients or our colleagues, as we are constantly receiving praise and positive feedback regarding how the building turned out, and I am frequently asked for (and happy to provide) your contact information by others who have contracting needs. 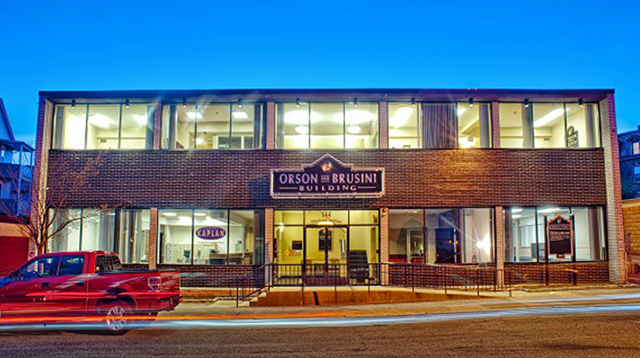 Orson and Brusini Ltd. is lucky to have found a contractor of the caliber of Picus Woodwrights. I am even luckier to have found a business ally, colleague, and friend like Greg Bressler. I cannot stress enough how highly I respect you and your work and how strongly I would recommend you and Picus Woodwrights to any potential client.